Jeannie Pielle was born in 1888. Her mother, Martha (nee Timothy) was the sister of Sliammon Chief Tom Timothy and her father, Billy Pielle, was the son of Old Pielle, said to have been born on Hernando Island around 1840. Jeannie was one of several children born to Martha and Billy. 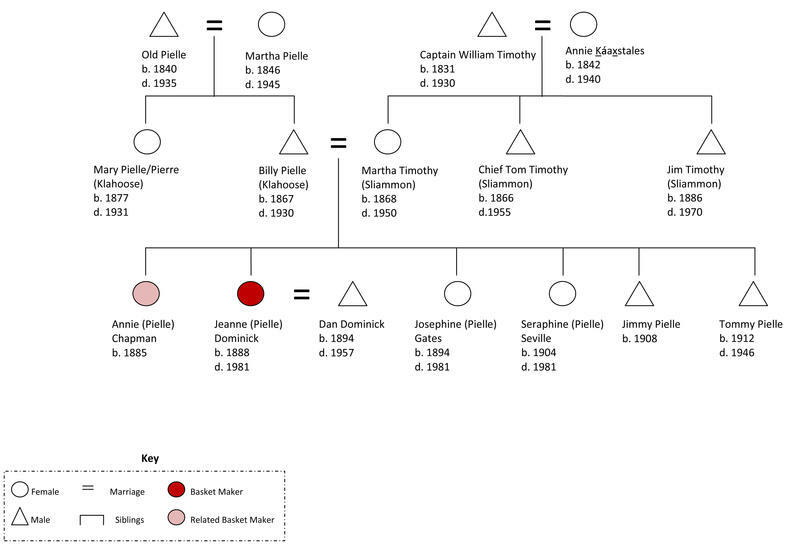 Her siblings included a sister Annie, three years older than herself, 2 younger sisters - Josephine and Seraphine, and 2 younger brothers, Jimmy and Tommy. Of the four girls only the two eldest, Jeannie and Annie, became basket makers. In the 1880's when Jeanne was born, the Klahoose population was divided between a number of mainland villages situated in Toba Inlet and Ramsay Arm. It is likely that Jeannie was born in one of these inlet communities. 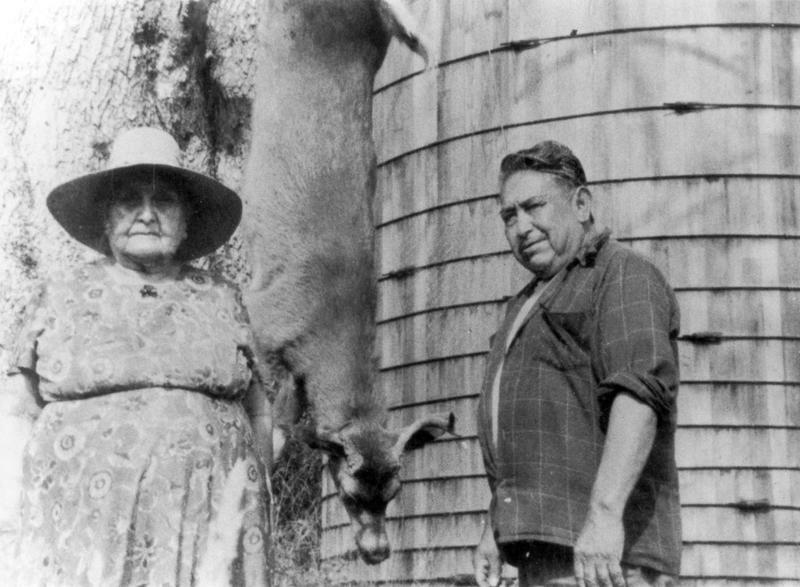 When she was about 8 years old many Klahoose people began to relocate to the east coast of Cortes Island. They settled at a place called Tork or Tu7kw in the Comox language - a community known today as Squirrel Cove. Jeannie married a Klahoose man by the name of Dan Dominick. Dan was a younger brother of Johnny Dominick who was one of anthropologist Homer Barnett's Klahoose cultural advisors in 1935. Dan and Johnny's grandfather, Tl'aokwokt and his brother, Gwastanexwen, are said to have had hereditary rights to the area around Ramsay Arm and the Quatam River watershed. Dan and Jeannie made their home in Squirrel Cove where they raised a large family. Tragedy struck in 1930's and 40's when there was a terrible outbreak of TB in the community. Effective treatments for this disease had not yet been developed - in the 30's and 40's mortality rates were invariably high. Because the disease is highly contagious patients were often isolated in sanatoria, but these facilities did not exist on Cortes Island. Afraid that her children would be sent to residential school as was common at this time, Jeanie refused to let them be taken away from the community and insisted on looking after them herself. Sadly, eight of Jeanne's children were lost to the disease. 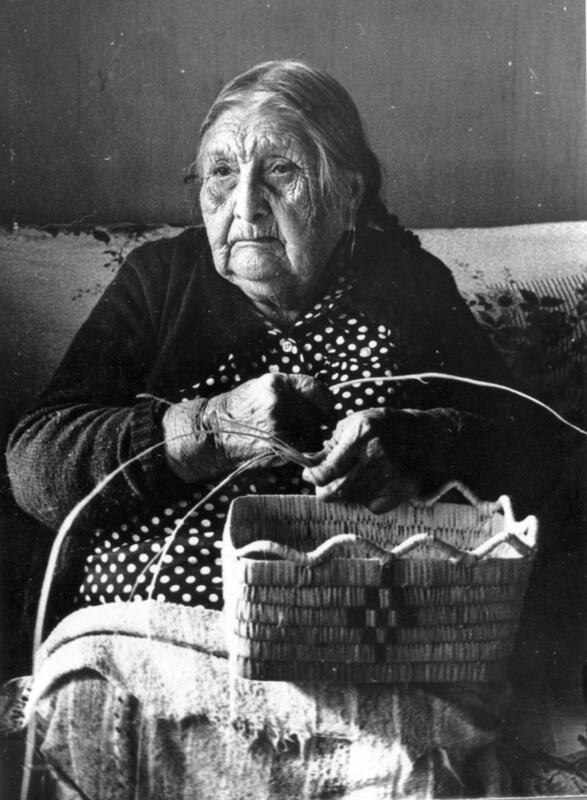 Jeannie was a prolific basket maker. Squirrel Cove was/ is a favourite stop for pleasure craft travelling up and down the coast, and many tourists came looking for baskets to buy. The baskets Jeanne sold to these visitors are no doubt scattered far and wide. 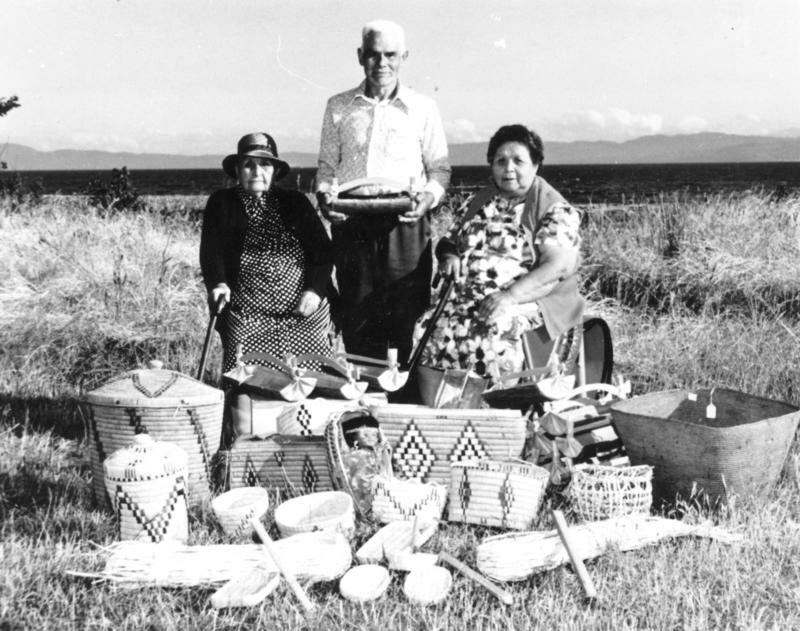 Fortunately for us, unlike many 20th century basket makers who turned to basketry primarily as a source of income, Jeannie also made baskets as gifts for her family and friends. We are fortunate to be able to include some of these here - much treasured and still in family collections. Jeannie continued making baskets well into her old age. Her neice, Rita Pimlatt, recounts fondly how Jeannie would still go out digging roots even in her 80's. Only someone who has actually harvested roots can fully appreciate this bit of information. Jeannie died in 1981 at age 93. Jeannie was an extremely versatile basket maker. The diversity of techniques employed in the construction of her baskets is one expression of this versatility. While characterized by variety, Jeannie's work does exhibit certain regularities and preferences. Jeannie favoured motifs based on diamonds and “V’s”, alone or in combination. Diamond and ‘V’motifs are common to many northern Coast Salish basket makers who found a surprising number of ways to rendering these patterns and building up designs thru reduplication. Repeated ‘V’s’ for example are used to create the zigzag patterns that some basket makers refer to as mountains or waves. In contrast to other aspects of her work Jeannie made her diamonds in a very consistent way. Black dyed cherry bark outlines her diamonds. This is followed white, followed by red and, on some baskets, a second, inner block of white. See for example baskets CRM 995.6.4, CRM 974.9.2 and LH1. Jeannie’s choice of decorative technique appears to have been influenced by who a basket was being made for. In this sample, all of the pieces known to have been made for sale, have imbricated designs. Beaded designs are restricted to those pieces made for family and friends. Jeannie sometimes, though not always, used bundle coil techniques to construct the lids and bases of her round baskets and slats (or ‘sticks’ as they are sometimes called), to construct the walls. On at least one basket she combined both bundle coils and slats in the construction of the basket base. This mixing of construction techniques is not common in this inventory. 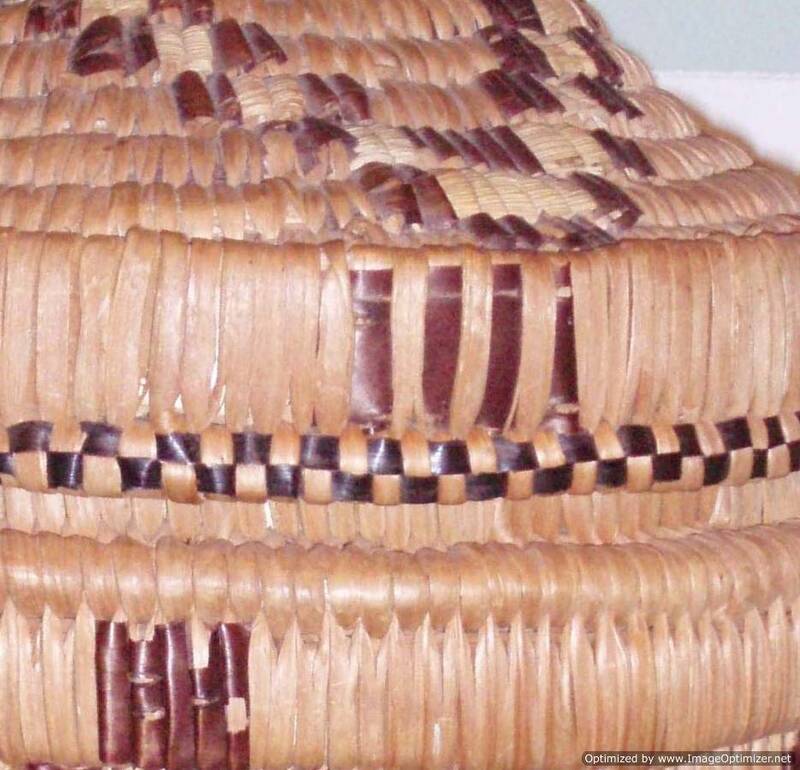 Most other basket makers used bundle coils primarily to finish the edges of their baskets and lids, something Jeannie did consistently as well. The stitching on the bases of Jeannie’s baskets also exhibits unusual variability. She sometimes used type 1 stitching at one end of the base and type 3 stitching, or 3 and 1 mixed, at the other. Baskets LH1 and LA1 provide illustration of this. 3 of Jeannie’s 4 lidded baskets in the inventory have clusters of 4 imbricated lines at intervals around the lid rim This combination appears to be unique to Jeannie’s work. The only lidded basket to lack this feature is a specialized form where the style of the basket precludes it.